Lets' say i want to power a 400w high pressure sodium grow lamp for﻿ 18 hours per day. How long would I have to ride the bicycle generator for? How would I configure the system to run the 400 Watt grow bulb? How can pedal power be used for Science Fair / S.T.E.M Night - Human Powered Slot Car Racing? How does a blocking diode work with a pedal power generator? For an adult, what would be the optimum specs for a Permanent Magnet motor used as a generator? How does a pedal power bicycle blender work? How do I power my television with pedal power? How many watts can a typical person put out? How many Volts & Amps can a typical person on a bicycle generator put out? What factors should I worry about when making or using my alternative energy generator? Why can't I save energy to a battery and have it feed back to a motor to drive my generator? How do I decide on the voltage / current / horsepower ratings for a DC permanent magnet motor that will work as a pedal power bike generator? 12V vs. 120 Volts? Where can I get free DIY (do it yourself) plans for a pedal power bicycle generator? 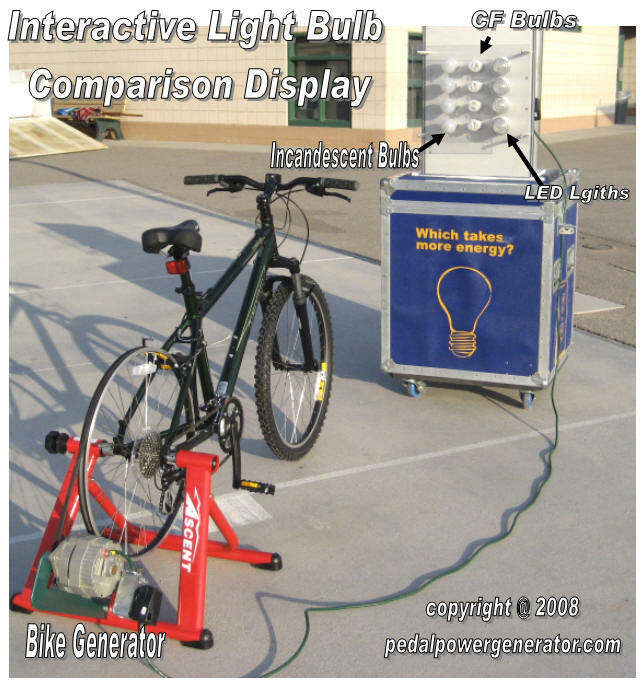 What are the most popular school or public events to do with bicycle generators? What method is better to drive my generator? Belt or roller? How Much Money Can I earn from pedal power kW-hours? What happens if I exceed the current rating of the permanent magnet DC motor - generator? How do I calculate or measure power created by a bike generator? How long would a 55 Amp hour batter last when powering a 100 Watt light Bulb? How efficient is the human body at producing power? What does the battery term AH or "Amp - Hour" mean? How do I convert Watts to Calories burned? 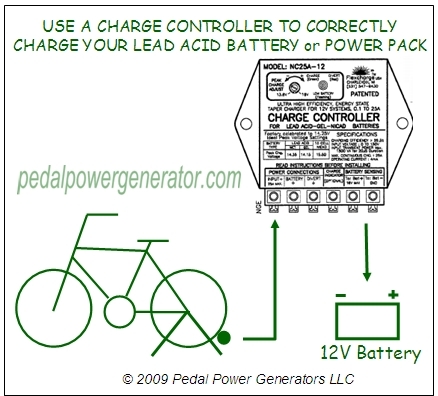 Can I charge a lead acid car or AGM battery with a bike generator? How many amps & Watts do I need to supply to charge a lead acid car or deep cycle battery? 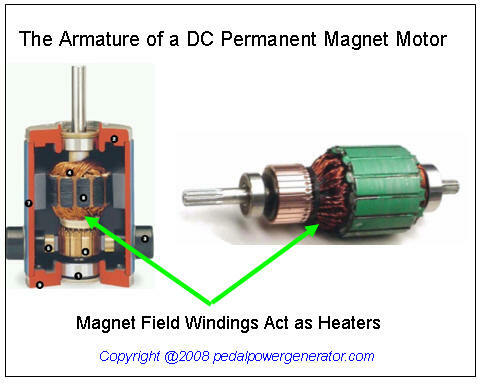 Why use a permanent magnet DC motor as a generator? How do I pick out the size of my fuses and wire sizes for my generator system? How do I measure DC current? Why run your power through an AC Inverter? How can I store the energy that I produce? 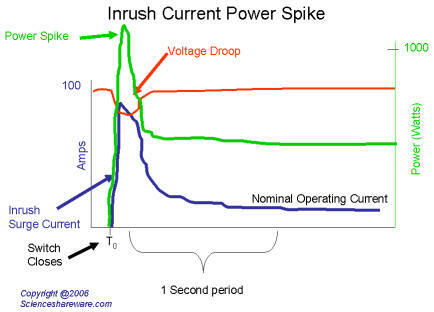 What is Inrush or Surge Current? What does the power look like during a current spike? What is the best way to get 12V DC regulated output from my bike generator to feed into an inverter? High school Science Fair question: What should I know about pedaling speed when delivering power to a 12 volt DC television running at 15 Watts. Lets' say i want to power a 400w high pressure sodium grow lamp and to leave it on for﻿ 18 hours per day how long would I have to cycle for how would i even rig a 400w hps bulb to that and store the energy ??? 1- Assume you want to power your grow lamp from a 12 Volt deep cycle battery . (There are other voltages you can choose besides 12 Volts). 2- Assume you are going to use an AC Inverter to convert 12 Volt battery Voltage to the operating Voltage of your Grow lamp which is most likely 110V AC. The problem with this setup is that it only will light the grow lamp if people are pedaling. So here is where we introduce the 12V Deep cycle battery into the solution. Based on calculations so far, we know it takes about 4 adults riding bike generators to power the lamp. So we have a 4:1 ratio. That means that if a person puts out 100 Watts for one hour while charging a battery, then the battery will only have enough energy to last 15 minutes. (That's assuming the charging process is 100% efficient which is not the case, it is really only about 70% efficient). How do I power my television or appliance with pedal power? There are four different configurations that can do this. (1)Bike generator with a 12V battery with external AC inverter, (2) Bike generator with a DCDC voltage converter or regulator (3) Bicycle generator with a 12V DC powerpack made by Duracell, Xantrex, or Black & Decker to name a few. (4) Bicycle generator with a GM 1-wire alternator and AC inverter. The following components are what you need when using the Battery approach. The following components make up the system that does NOT use the 12 Volt Battery but a DCDC converter or regulator instead. The following components make up the system that utilize a 12V Power pack. 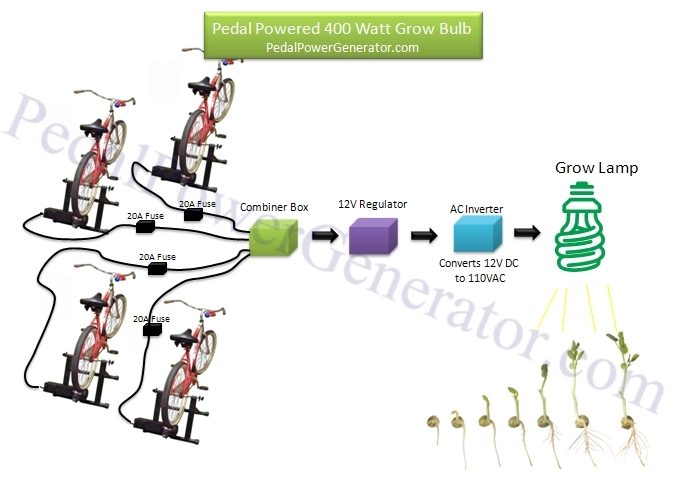 Where can I get free DIY plans for a pedal power bicycle generator? What are the most popular school activities to do with pedal power generators? Student children get real life experience performing the steps of this free laboratory experiment in calculating the amount of power needed to watch a 1 to two hour movie and in figuring out how long their deep cycle battery will last during that movie. When the students realize that their "power budget" is not enough to cover the movie, they will calculate how much additional energy needs to be put into the inverter lead acid battery powerpack to make it last long enough to be able to watch the entire movie. Click HERE for the steps on how to do this fun battery life experimental #1 lab. Click HERE to see the battery / solar panel classroom experiment #2 lab. NEXT IDEA : Watch Video Demonstration Here. The Light bulb comparison activity. Check out the picture below. This interactive energy display is educational because people get on and physically comprehend the difference between the power that 4 incandescent light bulbs use vs. power consumed by compact fluorescent and LED bulbs. If you are interested in making this display yourself or reading the operating manual click HERE. This fun display works by pedal Power. Teenagers and adults LOVE IT. It's a great teaching tool . The box converts 12Volt pedal power into 110 Volts AC. To see learn more and see a video demo, click HERE. More efficient and quieter in most cases. In my experience using a belt seems to be much quieter than the tire roller combination. Quietness is especially important when you are teaching kids in a class environment or trying to enjoy watching a movie when generating pedal power to your television. QUICK ANSWER: The belt / pulley method is more efficient than a roller at higher wattages. Soon data will be published on this page showing you the efficiency curve for each type of generator. For now consider the amount of force it takes to push your finger into an inflated tire about 3/8" of an inch. This measurement is called tire "deflection". Go out to your garage right now and try it out on your bicycle. You will notice that it is hard to do it. When you ride on a roller generator and you want to put out more than 100 Watts, then you would have to tighten the roller down so it has about a 3/8" deflection. If your tire is inflated to 50 lbs per square inch (P.S.I) and you push your thumb into the tire 3/8", then the dimple in the rubber that you make will have a surface area of about 1 Square Inch. The formula for Work = Force X Distance. So in this case every time you press your finger in it consume about 1/4 Watt of power. That adds up. If you want to put out more than 100 Watts of power, then your roller will start slipping if the deflection of the tire is only 1/8th of an inch. At this point you would say to yourself "I feel the bike wheel slipping when I ride, I need to tighten the roller". Then you would reach down to the roller and use the knob to tighten the roller against the wheel until your tire shows about 3/8" deflection. Each time your rear bike wheel turns one revolution, the roller will push the rubber part of the tire the 3/8" just like your finger did and much more! The roller touches a large cross section area of your tire, so it's considerably more surface area than your thumb pushes in. - your roller is pushing the rubber in across an entire cross section of tire! So All that work is going to waste! This is the equivalent of your pushing your finger into the tire rubber and out of the tire more than 100 times a second!! As you speed up to put more power, you use up even more power each second, just pushing the tire in and out on the roller. One last consideration is that the belt pulley or chain gear method is more dangerous for toddlers to get their fingers in to. Roller is the safest. Although the bike already has a chain and gear combination which is very dangerous for toddlers. So the point is probably moot. How do I decide on the voltage / current / horsepower ratings for a DC permanent magnet motor that will work as a pedal power bike generator? When looking over fractional horse power DC permanent magnet (PM) motors, one will notice that there are many flavors of them. Voltages ratings vary from 12V to 180Volts DC. Current ratings also vary quite a bit. 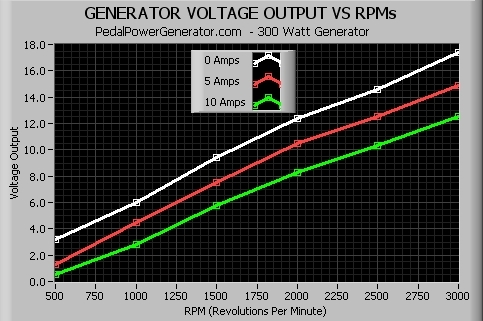 Here are some key points to consider when trying to select the best voltage / current / horsepower ratings for the DC PM to be used on your DIY pedal power bicycle generator. You must decide what the desired output voltage from your bike generator should be. Let's assume you are going to have it run in the region of 12Volts DC. You may ask why size the bike generator for 12 Volts DC? Because 12 Volts DC is common in the United States for powering TV, Computer, Laptop, LCD, through an inverter. 12 Volts DC is also in the range of where you will be able to charge a lead acid AGM Deep cycle battery for an alternative energy power backup system for your home. 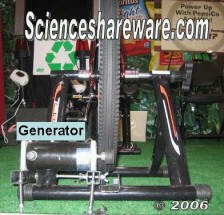 The next parameter to determine is the desired maximum sustainable power output from your pedal power bike generator. Typically an adult in great shape can peak at 300 to 400 Watts in short "Sprints" or bursts of speed. Also for a long 60 minute bike ride a person in great shape can average 100- 150 Watts of power. So in this case the max power would be 400 Watts, and the nominal operating power would be 150 Watts. (Always assume the worst case or higher rating to reduce risk to person or property). Now that you have your current ratings calculated you have established the most important parameter in selecting your DC PM magnet motor to be used as a generator. The danger of choosing a DC PM Motor that is rated for less current than you will have flowing through it is that it will over heat as explained in this section of the FAQ- click HERE. And how many revolutions per minute (RPMs) you can spin the PM motor generator at. The resistance of the armature inside the motor. The chart below shows theoretical data based on the bicycle generator being driven at a fixed speed of 2,000 RPMs. This is not real data from actual motors just theoretical data from a software program called LabVIEW. Real data will be posted once I have test results done in the next couple of months. What this data shows you is the theoretical load line or voltage droop when you increase the Wattage output or "load" for your DI bicycle generator. Assume you do an experiment with two types of PM motors. The experiment consists of pedaling the generator at a constant velocity of 2,000 RPMs while wired to fifteen 10 Watt Car Head lights through individual switches. The data below shows you the theoretical voltage output of the DC PM motor rated for 180 Volts (White Line), and the DC PM Motor Generator rated for 12 Volts (Red Line) as each of 15 theoretical car head lights is turned on. With no head lights turned on, the 180 Volt DC PM motor puts out 36 Volts, much more than the 12 Volt DC PM magnet motor's 14 Volts. However, after about the 10th head light is switched on and the Wattage load reaches about 100 Watts, you can see that the 12 Volt DC motor puts out more voltage than the 180 Volt PM Motor - Generator. Some people call this type of graph a load line, because it shows you how performance changes as the "load" gets heavier and heavier. So in summary, using the PM motor rated for 180 volts at lighter Wattage loads will require you to put in less speed than the other motor, but at the same time will be some what harder to pedal. The opposite is true for higher Wattages where the 12 Volt DC permanent magnet motor is the better choice for loads over 100 Watts because you will pedal at a lower speed then 180 Volt PM motor. 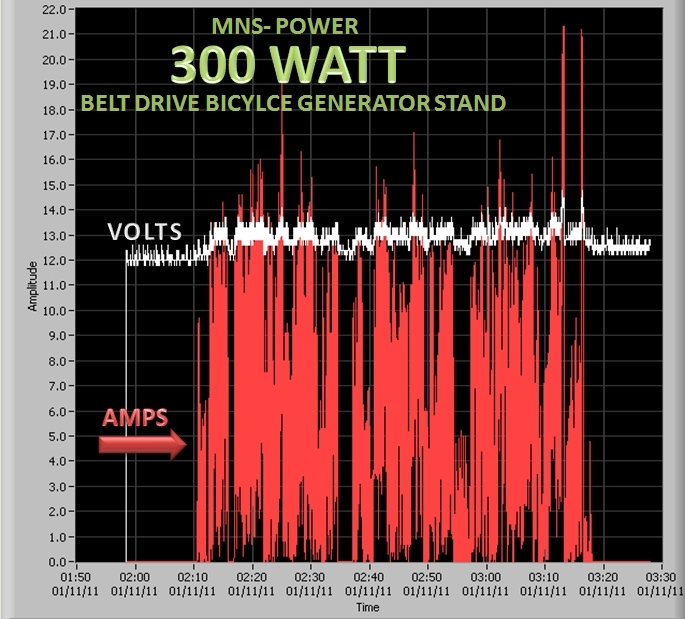 Perhaps a better way to look at this is to look at a comparison plot of how fast you would have to pedal for each PM Motor to maintain a constant 12 Volt output while varying the Wattage Load from 0 to 150. The graph below shows this simulated data. 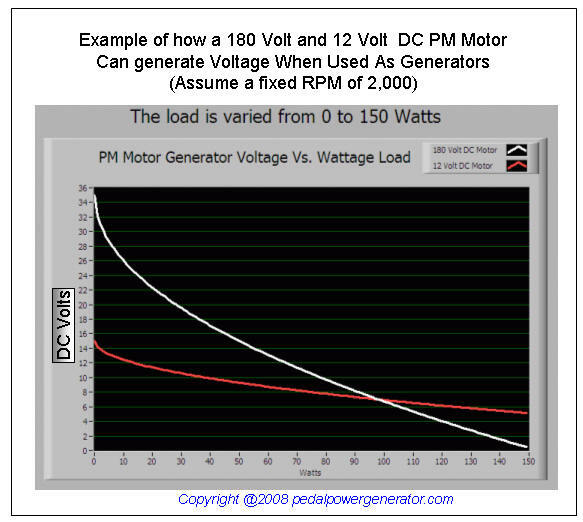 By looking at this graph, you can see that at little or no Wattage load, you will have to pedal much faster on the 12 Volt Rated PM Motor than on the 180 Volt PM rated Motor. 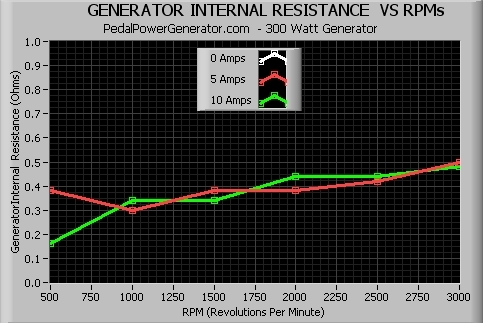 But at ~ 30 Watts, the tables turn and both bicycle generator PM motors will have about the same output at 1,700 RPMs. Note that at loads higher than 30 Watts you will need to pedal faster with the 180 Volt PM motor. So again, the conclusion is the PM Motor rated at 180 Volts DC is better for small loads, like a 5 Inch television that kids can power with a smaller bike using a voltage regulator / charge controller. But for Wattage Loads in the higher range, the PM motor rated for 12 Volts is better. Assume your power company charges you $0.10 per kW-Hour. This means that it would cost you 10 Cents to run a 1000 Watt projector for one hour while watching a movie in your living room. Now assume that you wanted to run that same movie projector by bike pedal power generator. You would need 10 adults in good shape. Each one would average about 100 Watts. So 10 People all at once pedaling for an hour would earn a total of $0.10 (Each of the ten bikers could split the money and walk away with a penny). So the bottom line in this example is you can earn about $0.01 U.S. Dollars per hour using a pedal power generator. Now the other scenario is if you are in a 3rd world country where there is no infrastructure to deliver power to your town. Assume it would cost more than a Million Dollars to pay for power lines and power poles to be installed along a path to bring your town power. What would a kW-Hour be worth then? Much more than $0.10 per kW hour !! It would cost $50,000 to setup 1,000 bicycle generators which is much cheaper than paying over 1 Million Dollars to bring in power lines. Continuing with this small village scenario, you would have to pay the inhabitants of the village to work in shifts pedaling the 1,000 bikes while hooked up to deep cycle batteries). This would provide people with many jobs in the village! FYI- Solar panels would cost 40 times than bicycle generators to implement. Part of that reasoning is that solar panels do not work at night time, so you would have to setup twice the wattage capacity as you would need to setup when using bicycle generators. If you are using a permanent magnet DC motor as a generator then you need to be careful not to exceed the manufactures current rating for your motor UNLESS you put a fan on it. This is because the current or "Amps" rating on the PM motor was calculated so that you could operate it under that current level without frying the armature. The armature has copper wire windings on it that create a magnetic field which pushes against the fixed magnets inside the PM motor housing, and make the shaft of the motor spin. The unfortunate byproduct of the magnet field is much heat dissipation. 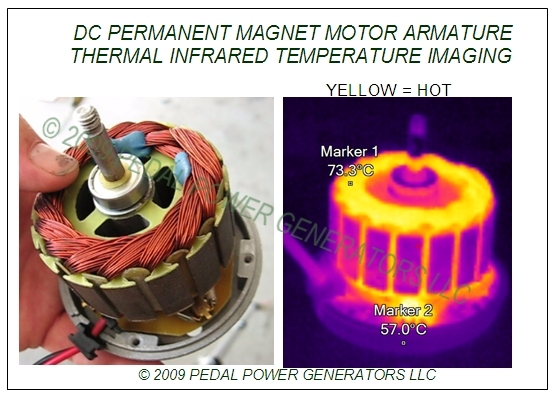 By looking at the image below you can see how the armature of a DC permanent magnet motor / generator gets hot when you use it. You can see that the copper wires around the armature are showing up as bright yellow. (For those of you who have not watched the movie "Predator", the image looks this way because a thermal temperature infrared IR imaging camera shows you hot and cold of an object by painting different temperatures as colors). The brighter the color the hotter the temperature. Keep in mind that most motor armatures can run at a temperature as high as 100 Degrees Celsius. But be warned that if you operate at that temperature or higher, you will start to smell a strange burning electrical smell in the room like when a blender gets too hot. In this experiment above only 3 Volts was put on this armature which drew about 4 amps. Using the formula for power: Volts X Amps = Watts we can say that the armature was dissipating 12 Watts of power. After 10 minutes it rose to a temperature shown at Marker 1 above of 73.3 degrees C. Note that this armature was not installed in the motor body housing so during this test it was not spinning in it's normal magnetic field where it would have drawn less current and stayed cooler under a no-load condition. Below you can see thermal temperature information for a test where a PM Motor is being used as a generator putting out 25 Amps of current for a 10 minute period spinning at 2,100 RPM. Note that in this case there is a fan attached to the motor so Marker 2 is much cooler than marker 3 because the heat is being drawn towards the back of the motor as the cool air enters through the front. Note also marker 1 which shows you the armature temperature is 84.3 degrees C, which would burn your hand if you were able to reach in touch it. How do I measure power generated by a bicycle generator? Can I charge deep cycle or AGM lead acid / car battery with a bike generator? Yes, a permanent magnet DC motor used as a pedal power bicycle generator can charge a lead acid deep cycle / car battery. Data captured using software from http://wattsview.com This graph shows you the battery charging Amp-Hours from a 40 year old casual rider who works out 2 to 3 times a week. The green trend line shows you that after a 20 minute workout, the total amp-hours reached 1.8 This took the Duracell Powerpack from a SOC (State of charge) of 10% to 30% while it had been powering a laptop data logger computer which consumes 20 Watts. This laptop was running the WattsVIEW software that recorded this data. To completely charge the Duracell Powerpack when it is dead, you would need to put in anywhere from 6 to 10 amp hours. Depending on how fast you ride. More info on charging lead acid batteries here. A a charge controller is recommended for lead acid battery charging as shown in the diagram below. One of the cheaper solutions you can try and use is the NC25A charge controller. If you want to learn more about this charge controller then click here. Assuming the inverter is 80% efficient, then the total power coming from the battery would be 120 Watts which translates to about 10 Amps of current flowing from the battery. Below is a discharge characteristics graph for a Power Sonic 55 Amp Hour battery which is comparable to the Power Star battery. Looking at the discharge characteristics graph below, you can see that a 9.5 Amp load lasts about 5 Hours. Keep in mind that you would never want your battery to discharge below half of its capacity because it would shorten the life of your battery. So the final answer to how long a 100 Watt light bulb would last on a 55 Amp Hour battery would be about 2.5 hours (which would leave your battery half charged after the 2.5 hours had elapsed). If you buy 4 55 Amp Hour deep cycle batteries then the battery life out to be a little better than 4x so a 100 Watt light bulb could run for ~25 hours before all 4 batteries were fully dead. If you were to protect your batteries with a LVD (Low Voltage Drop out) at 50% state of charge, then the 100 Watt light bulb would last about half that time which would be about ~12 hours. 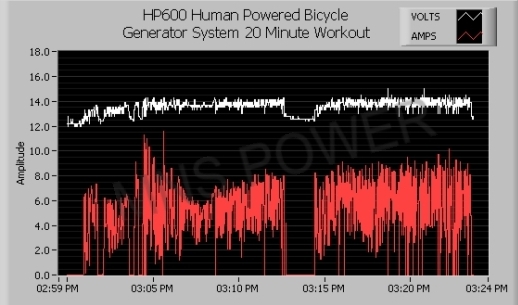 How efficient is the human body at producing power on a bike generator? Typically the average person is able to run about 25% efficiency. This means that for every Watt produced by a bike generator, the person doing the pedaling is putting out 4 Watts. So if you are pedaling to provide to your laptop computer at 80 Watts, you body is really running at 240 Watts. What does the battery term AH or "Amp - Hour" rating mean? The amp-hour rating of a battery (also known as "AH") is a measure of how many amps a battery can supply for a period of time. It is calculated using the formula Amps X Hours. For instance, in the ideal world, this rating would mean that if you have a 33AH 12 Volt battery, you should be able to supply 33 Amps (~412 Watts) out of it for 1 hour, or 16.5 Amps (~206 Watts) for 2 hours, or 8.25 Amps (~100 Watts) for 4 hours, etc. Unfortunately we don't live in the ideal world, so the values above are not spot on. It turns out that your battery has more Amp Hour capacity when you use it at lower Wattage and Amperage levels. So the values above are just very rough guidelines. Each manufacturer may calculate Amp hours differently which is to say they may manipulate the test to get themselves a very high Amp Hour rating which can mislead people like you and me. One common Amp Hour rating is based on using 20 hour time period where at the beginning of the test the battery is 100% charged having a voltage of 12.8V and at the end of the test it would be 0% charged with a voltage of approx. 10.5. The goal of this test is to find the maximum amount of current that the battery can put out evenly over the entire period of the test. If the battery successfully provided 1 Amp of current (Which is about 12 Watts of power) for the entire 20 Hour period, then the Amp Hour rating for the battery would be 1Amp X 20 Hours = 20AH. 1.7 Amps X 10 Hours = 17 AH rating. It changed by 3 Amp Hours! A good battery manufacturer will give you a Amp Hour Curve like the one below from Power Sonic which describes the performance of a 33 Amp Hour deep cycle battery. It shows how the rate of discharge changes in relation to the amount of Amps the battery is putting out before it is completely discharged. Powerstar has a knock off version of this same battery with similar ratings for about $60. This chart shows you that if you power something with your battery that takes 750 Watts or about 66 Amps (750W / 12V = 66Amps), then this battery will be dead after about 12 minutes. On the contrary, it also shows you that if you power something that requires only 20 Watts of power or 1.65 Amps, your battery will be dead after 20 Hours of operation. That's a difference of over 19 hours!! The problem is that many battery manufactures do not take the time to publish this kind of fantastic data curve. They just give you ONE POINT on that curve and expect you to deduce the rest of the information! What a joke! When you look at the label of Oreo cookies or other food items at teh store, the term "Calories" is realy (kili-Calories). So you divide by 1000 to get 86 Calories. Calories burned running a 100 Watt Television for 1 hour = 86 / 0.25 = 344 which is about equivalent to one piece of PIZZA! Here is a power output table for different human power generators you can look at based on some approximations. How many volts & Amps can a typical person put out? Your voltage output range depends on what type of generator you are using. For instance, if you select a 24 Volt permanent magnet motor to drive with your rear bicycle wheel. You could get a voltage range of 0 to 50 Volts Messy DC. 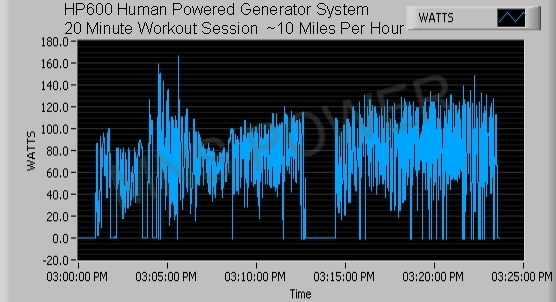 Data captured using software from http://wattsview.com This graph shows you voltage and current throughout a 20 minute bicycle generator workout period using the PPG-R75W pedal power bicycle generator system sold here. The white trend line is shows the battery voltage of the Duracell Powerpack. When the generator is not being driven, you will see that the Duracell battery is about 12.2 Volts DC. You can also see that the built in battery charge controller keeps the max voltage on the battery around 14.5 Volts DC range. This is a healthy voltage / current level to best charge your lead acid AGM battery powerpack. The red trend line shows you how much current flowed from the bike generator to the duracell powerpack. Click on the Amp-Hour chart to see the total amount of amp hours. AC inverters have built in voltage input protection that allows for safe operation of your AC powered item. Let's say you are trying to run a 12Volt TV That comes with an AC adapter. You would have two ways you could power that TV with your DC pedal power bike generator. 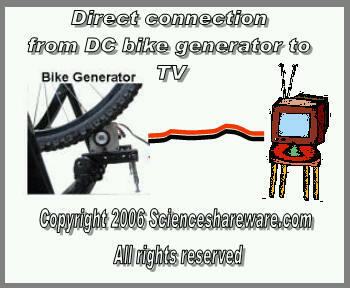 First you could hook up your pedal power bicycle generator directly to your 12V Television TV. The problem is that your TV might blow up in smoke if you provide it with 10 Volts or 14 volts. So it would be very hard to give the 12VDC TV Exactly what it wants. It would be much safer for you to supply bicycle generator power to your TV through the AC inverter as shown here because as soon as your bicycle generator is not providing 12V, the AC Inverter will alarm and you will know that you need to pedal faster or slow down because you are pedaling too fast. If you want to store the energy that you produce the easiest most efficient way is to use a car battery or even cheaper a yard vehicle battery which cost $17.00 at your local Walmart. This battery will store incredibly large amounts of energy. If you setup LED lighting for your house - you can run it from the 12V battery. Or if you want to power your computer with a 12V Car battery you can hook it up to an AC inverter which will convert 12Volts DC to 110 Volts AC. How do I pick out the size of my fuses and wire for my generator elecrical system? Let me first start by saying the standard disclaimer stuff that you are responsible for following electrical guidelines established in your part of the world. In the U.S. you must comply with the national electrical code (NEC). Attention should be given to Articles 310, 392, 400-5 (flexible cords), and 501-4 Class I, II and III, Divisions 1 and 2 hazardous locations. Remember to use the "Ampacity Correction Factors" when the Ambient Temperature is different than those indicated in the Tables. Also, derating is required when using more than three conductors in a Raceway or Cable. You need to have a certified electrician or automotive mechanic look at your wiring to make sure you didn't do something dangerous. With that said, a typical person generating power at 12 volts will get a max current of about 10 Amps. 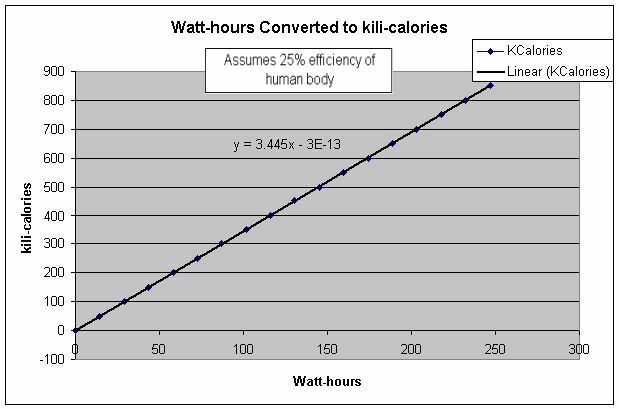 This is calculated by assuming a case where a fit adult person can average 120 Watts over a 10 minute period. Using the formula Watts = Volts X amps you can solve for Amps = Watts / Volts = 10 Amps. Now double that value to make sure you have chosen a safe current limit. When you look up the wire size requirement for 20 Amps in free air at 60 Degrees C you will note that a size 12 AWG wire is well suited for this rating. Play it safe and pay $5.00 more in wire and get something that will not warm up when you supply current through it from your bicycle generator. Your fuse should be rated for the same rating as your wire. You can buy inline fuse holders from your local automotive parts store. They are cheap! Here are some more very conservative current ratings, ones that are used for very confided spaces like when your wire is inside of a metal conduit pipe and there is no free air to cool the wire down. It's best to plan for the unexpected and select a wire size one or two sizes bigger than you really need, and select a fuse size as small as you can use without blowing it. It is a matter of life and death - fires can be started and burn down your home. NOTE: The American Wire Gauge sizing system is counter intuitive! You may thing that a bigger size is better for carrying more current, but you are wrong! It is the opposite. 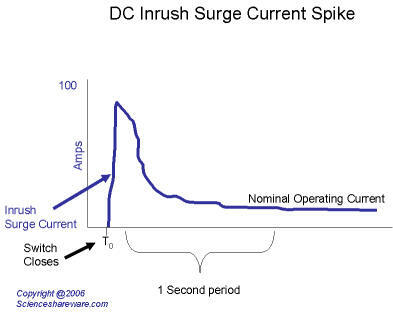 What is an inrush / surge current spike? When you turn something on, there is often a large spike in current as shown in the waveform plot graph chart below. If you are turning on a motor or something that has a lot of capacitance you will see this type of behavior of the current. A motor like a kitchen blender or electric weed eater takes a couple of seconds to spin up. During that time the resistance of the motor changes from being very low to high. When the resistance is low, the motor requires or "draws" more current then it's typical nominal operating current. Below you can see an example of voltage droop. 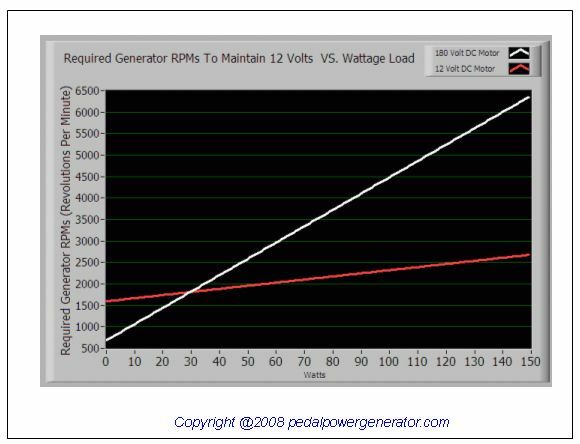 This is data from the 300 Watt DC bicycle generator shows that the voltage level of the generator is decreased as the output load is increased. For example at 1,500 RPM we see that the bicycle generator puts out about 9.3 Volts DC s but when generator is putting out 5 Amps of current, the voltage droops down to about 7.5 Volts DC. FYI- a generator with an internal resistance of zero Ohms makes the ideal generator - which unfortunately does not exist, but is what many strive for. Internal resistance of a generator is bad because power is lost in the form of heat inside the generator which also something called "voltage droop" or "IR" Drop. Below you can see that this bike generator has an approximate internal resistance of ~0.35 Ohms. When there is a big surge in current, you may see a dip in the voltage being supplied by the voltage source. This is sometimes called voltage droop or "the IR drop". Typically voltage droop is very bad in a system, it can cause problems in the case of supplying voltage to an AC inverter. The AC inverter has a built in protection circuit that turns the inverter off if it sees a voltage less then 11V DC. So if you have TV hooked up to the inverter that has a big inrush current spike, the voltage will droop and the inverter will turn itself off by going into protection mode. You can minimize voltage droop by having large wires or cables and good solid connections with a lot of surface area. An example of a bad connection is alligator clips. These have only a tiny bit of surface area contact with a wire so the resistance of that connection is very high. What should I know about pedaling speed when delivering power to a 12 volt DC television running at 15 Watts? television. We are connecting a permanent magnet DC motor as a generator to a 15 watt television. You can power up your 15 Watt television but you have to watch a volt meter carefully and pedal at just the right speed so your voltage stays within the operating range of your DC powered television. You need to look at the owner's manual for your T.V. and look at the specifications to find out what the min and max voltages are for your T.V. Typically a D.C. voltage television will run in a range of 11 to 13 volts. If some one gets on your bike and peals too fast, or too slow, they could easily fry your t.v. or as some say in the industry "let the smoke out of it". If you take a look at this video clip you will see a D.C direct current permanent magnet (PM) bike generator hooked up to a volt meter and to a television through an inverter. When you see the video clip, you will notice that the volt meter is jumping around between 10 volts and 13 volts. This is because it is difficult to pedal at a precise speed to keep the bicycle generator output constant at 12 Volts. But it can be done very carefully. The inverter in this video clip (the orange box in between the volt meter and the T.V. ) makes a beeping noise every time the voltage is not between 11 volts and 13.5 volts. It is giving a warning to let you know that your voltage is out of range. If you wanted to help make the voltage coming from your D.C. bicycle generator, then you could add a capacitor to it, but it is expensive. Click here to look at a typical capacitor you could use. Can be done but can fry your T.V. if you pedal to fast or too slow. Connect your dc generator to your tv through an inverter. Can be done and will give you an audible alarm when your voltage is out of range. You would have to use an AC plug in adapter between the inverter and your tv. This is because the inverter puts out 110volts AC (the same as the wall outlet in your home). The risk is that if some one pedals too fast, they could easily fry your inverter. Usually an inverter will protect itself against over voltage damage up to somewhere around 20 Volts. If a show off gets on your bike generator and pedals too fast and gives the inverter more than it's allowable "Max Input Voltage" your inverter will go up in smoke. I know, I had some one do it to mine at a show. Connect your dc generator through to a capacitor and then go through an inverter to your t.v. This approach is only good for providing power to something that requires 50 Watts or less. Examples of this are cell phones, or a small black and white TV, or PS2 Sony Playstation II. If you hook up a TV or something that requires more than 50 Watts, you will find the bike is too hard to pedal. The good thing about this approach is that the voltage is automatically regulated at 14.8V DC now matter how fast you pedal. One issue is that you have to give the alternator 1800 RPMs before it will start working. Typically an adult can only do this.